Dr. Robotnik's Mean Bean Machine is somewhat of an anomaly. It's a Puyo Puyo puzzle game that takes place in the Adventures of Sonic the Hedgehog - a short lived but wildly popular television series from the mid-90s - universe, but the blue blur is completely absent. Instead, the only hero here is you, a presumably anthropomorphic mammal who must stop the bad doctor before he can enact his diabolical plans. 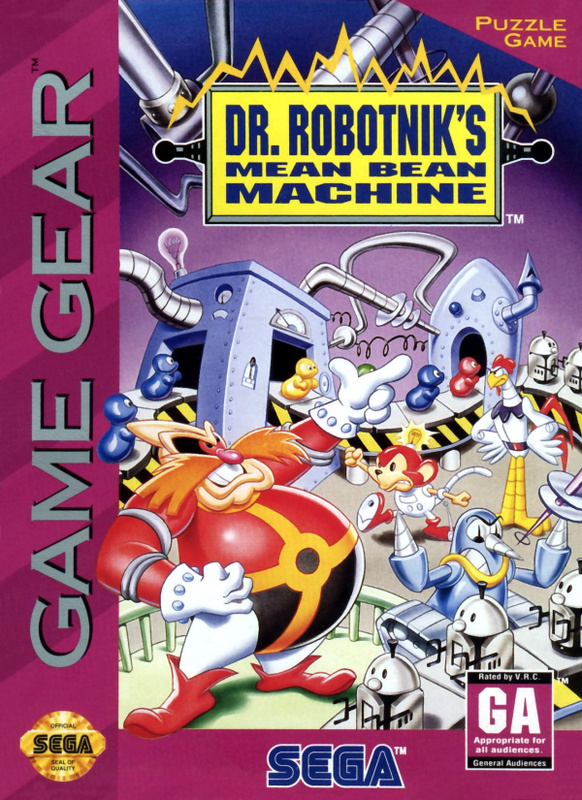 Mean Bean machine is loosely framed with a plot involving Dr. Robotnik's desire to turn all of the bean people of Mobius into robot slaves. The plot is hardly present in the game and it exists merely to explain away the Sonic universe's presence in a Puyo Puyo game. Thankfully, the general gameplay mechanics from this beloved sub-genre remain almost entirely untouched, proving for a satisfying experience overall. For those unfamiliar with how Puyo Puyo works, it is essentially a tile matching game with a strong emphasis on chaining combos. 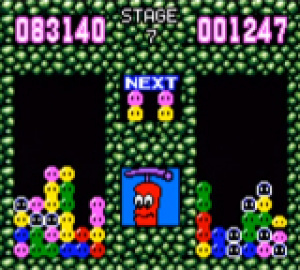 In Mean Bean Machine, pairs of coloured beans drop from the top of the screen down into a column designated as your playing field. Connecting four or more of the same coloured beans either horizontally or vertically will cause then to disappear, making any beans stacked on top of them drop further into your column. If you're a Nintendo exclusive gamer, then you might be familiar with the SNES version of the game featuring the adorable pink puff, Kirby's Avalanche. This is the type of game in which the amount of fun you get out of it is directly correlated with how good you are. The bulk of gameplay lies in Scenario Mode, a campaign mode that has you facing off against 13 CPU opponents, including Robotnik himself, and it can get a bit frustrating. As you connect beans and achieve combos, more beans will get dumped into your opponent's column, and the higher your combo, the more damage you'll do. Fill your opponent's column to the top, and the game is yours. Though the levels get increasingly faster and more brutal, the whole thing is pretty forgiving as it allows you as many continues as you need, assuming you haven't already hurled your 3DS at the nearest wall. For players hoping to hone their bean matching skills, the included Puzzle Mode presents you with certain tasks such as eliminating all of the red beans on screen, or eliminating 11 beans at once. If completing the puzzles isn't enough, then you can take to the Exercise Mode, which is essentially an endless mode in which the speed and difficulty level gradually increase. In this mode there is no one to play against, but your high scores are saved to the in-game leaderboard as a way to track your improvement. There is also a multiplayer or “Gear to Gear" mode that allows you to play locally against a friend, but this is unfortunately absent of download play. 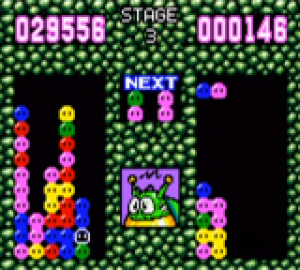 Both players will need to have Mean Bean Machine installed on their 3DS in order to play against one another. If you can convince one of your friends to take the plunge though, sharing the frustration among pals can be fun, and there's little more satisfying than performing a crushing combo that subsequently dumps a bunch of beans into your friend's column, then laughing right in their face as you parade in victory. The graphics may look a little dated, but the truth is that this type of puzzle game does not require much in terms of prominent visuals. 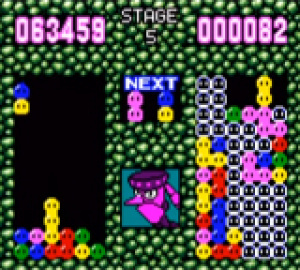 All of the beans are the same shape, however, which could prove to be problematic for players who have trouble differentiating between colours, but the visual style is effective beyond that. The soundtrack is also a bit light on variety, but the few songs that are provided are sure to stick with most players for a while. 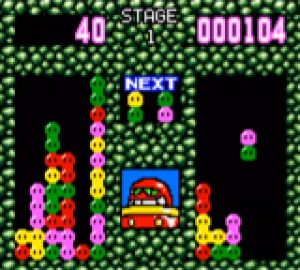 Though it may be a bit dated in terms of aesthetics, Dr. Robotnik's Mean Bean Machine's Puyo Puyo style gameplay remains fresh nearly 20 years after its initial release. It's a challenging game that may not appeal to all audiences, but fans of the puzzle sub-genre will be delighted with this 3DS Virtual Console release. remember the multiplayer on this from the megadrive, was good fun, may give it another try. Ahhhhhh. Look at those screen shots, so 90's!!! Great review, although I would have given it an 8. The Genesis version was waaaaay too hard for me. Since this doesn't sound any easier, I think I'll pass. I bought this because I watched The Adventures of Sonic the Hedgehog, played the Genesis version, and believe this is better because it is mobile. The Genesis version looks and sounds better, but it doesn't play any better, nor does it have the fun Puzzle Mode. @mystman12 I agree, an 8 is a more appropriate score in my opinion. I have nerver played any of the puyo puyo clones so I'll keep this one in mind. Thanks for the review. I already have the Genesis version so I'll pass. I actually beat this game - I nearly had a nervous breakdown from frustration, but yeah, I beat it. Yeah, I just beat the campaign, and I'm pretty sure that it was easier than the Genesis version. (Which I've never beat, but I haven't played it that much.) It was a good challenge though, and now I'm going to try and beat it without using continues. Plus, I'm still stuck on one of the puzzles. The Genesis version is AWESOME! Love this game! Hope it comes to the US and Canada. The beans not having distinct shapes kind of bugs me, but having it mobile and a puzzle mode seems pretty decent. Oh well, good game nonetheless. Have this on the Sonic Mega Collection on the GC and somewhere on the original Genesis cart. Computer was super hard in the Genesis version and I still remember being super frustrated. Fun and addicting though. I recommend picking this up as it is the ideal game to have on the go. **Also, I love how the original box art back in the day has to have the triangle in the corner to specify: Puzzle Game. This way, the Sonic-action game crowd would be warned. Maybe it's just that I always have Tetris on the brain, but I always think of this game as constructing tetrominoes, which I find more interesting than just lining things up like Columns or Dr Mario. The Scenario mode can be beaten by luck rather than skill though, and it's not very engrossing, so it's kind of weird that something called Exercise mode feels like it's the real heart of the game. It's definitely worth the $3 though. It is in the US eShop right now. It was added this week. For some reason, it wasn't put on the front page, so you have to search for it. @OdnetninAges Actually, you can find it in the Virtual Console section of the eShop. I remember playing and beating the Genesis version back when I was 4 years old. Definitely going to pick this one up soon. NOSTALGIA. It's so cheap too! I might get this. I actually think this version is better then the 16-bit version. The "exercise" mode lasts alot longer, and is more fun, (the has-bean item is also more common, I almost never get it in the 16-bit version) and the "puzzle/training" mode is a very welcome fun addition, (that the 16-bit version doesn't have) and justifies a purchase of it. It also apparently has 2-player mode in tact. It's also alot cheaper then the 16-bit version, and portable justifying the purchase even more. @CanisWolfred This version is easier. So I finally downloaded this game last weekend. I had been putting it off since I've not been downloading many Game Gear games but I do like Puyo Puyo. Its a fun game but it gets way too fast after a few rounds. I'm enjoying it so far, but I think Kirby's Ghost Trap may be a much fairer game. I'm looking forward to that coming to the Wii U VC.